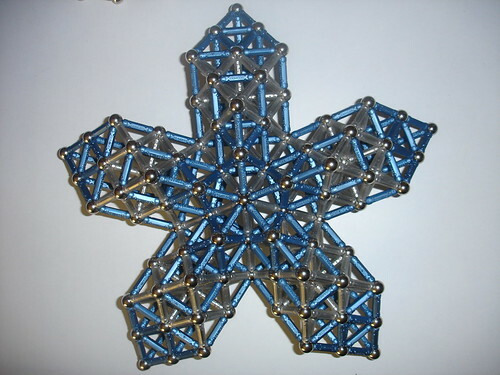 This is a repost of one of Peter's excellent models from the old Geomag forums. If you happen to own 1020 Geomag bars, 120 diamond and 60 square panels, here's how to build the big sphere with panels recently added to the Geomag Gallery. 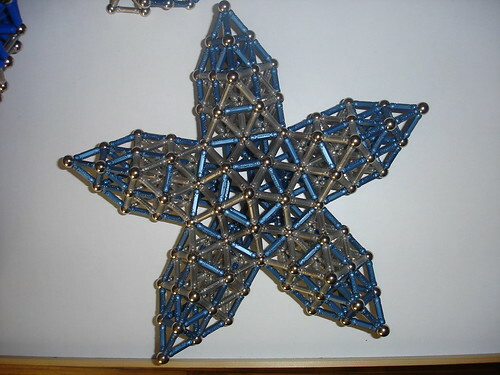 It's basically a dodecahedron (a ball with 12 sides) made of modules that look a bit like flowers. Below is one module. 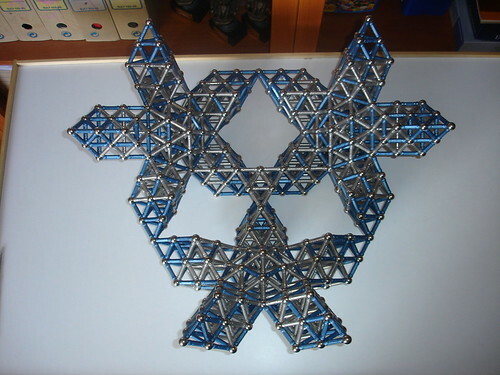 You will need 80 bars, 10 diamond and 5 square panels to build it. 12 modules are necessary for the large sphere. If you don't have 1020 Geomag bars, at least try to build one module just for the fun of it. It will spin like a top on a flat surface. Here is how you assemble the modules, 3 of them join together at the pointy ends. 3 bars for each connection (marked in red) provide extra stability. Nice. This twelve-module approach seems very productive. Wow, that is so fabulous and beautiful!!! Inspiring!!! I hope I can find time to have a go at it. If I do I'll be sure to post a pic here. The "clear petals" in the ball are a later addition, I think. I even drew red circles and wrote x12..
these panels hang in weakly. for the bottom face) and then pop the bars out and apply the clear petals at the end. The build crew: Sasha Niko and me. I'll post some more detail shots in a minute. Last edited by karlhorton on Tue Jan 19, 2010 4:28 pm, edited 1 time in total. exciting, because just one slip can break the model whilst in progress. tunnel under the pentagonal pyramid inside. in a never used ziplock till this project, so it's good to get them out. a Geomag trade show in 2006.